Social media have brought Kenya into focus recently, with people’s reactions to the attack at the University of Garissa spreading on Facebook and Twitter. Social media users have been sharing an image of a candle against a black background, accompanied by the single word “Kenya”. In this way they have demonstrated sympathy for the 148 victims and show that they care. The reactions have been not only to the actual attack, but also to the fact that there was relatively little international attention to it when it happened. Today, the Nigerian schoolgirls are still in captivity. 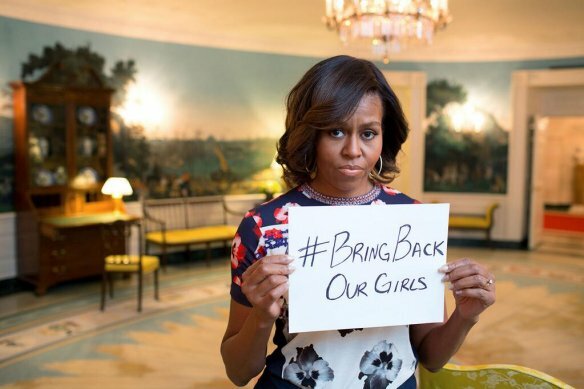 US First Lady Michelle Obama initiated the #BringBackOurGirls hashtag in support of the 2014 Chibok kidnapping. Posted to the FLOTUS Twitter account on May 7, 2014. Relatively is the crucial word in this context. The massive social media reactions to the January attacks in Paris, which targeted the staff of Charlie Hebdo magazine and a Kosher supermarket, have been used to highlight the unfairness of the more subdued response to the attack in Garissa. Paris has become a yardstick for measuring differences in responses depending on whether the victims are “ours” or “theirs”. Where are all the people who adopted the Je suis Charlie slogan now? And did anyone say that they “were” the little girl who was forced to wear a suicide bomb in Baga in Nigeria, the scene of the Boko Haram attacks that occurred at approximately the same time as the attacks in Paris? What is it that makes us react more to certain injustices, conflicts and crises than to others? What can one hope to achieve through mobilization on social media? First and foremost, it is clear, and to a certain extent natural, that crises that are either geographically nearby or that affect “our own people” will always attract more attention. But exceptions to this rule do occur: reactions to the attacks in Copenhagen, so close to Norway, on 14 February quietened down relatively quickly, although the response of the young Muslims who formed a “peace ring” to protect the synagogue in Oslo did arouse attention and sympathy. When it comes to events that occur further away and that involve suffering among “the others”, there is a great deal of difference in the amount of attention we devote to them. While we are now paying more attention to the terror victims in Baga and Garissa, the victims of terror attacks in Afghanistan and Iraq have gradually become brief news items, unless Western victims are involved. Crises that become “newsworthy” and mobilize support have some recurring features. These features may involve the extent of the catastrophe, what kind of disruption with normality it constitutes, and last, but not least, the kind of narrative that emerges about the crisis. Another very significant factor is whether a crisis is presented as a fight for a greater cause – for example, children’s right to education, women’s rights, democratic freedom, freedom of expression, or opposition to genocide or to the persecution of particular ethnic or religious groups. Declarations of sympathy also come more easily in situations where it seems clear that one party is the victim and one party is the aggressor, rather than in cases where there is a conflict between two equal parties. A perception seems to have emerged that the threat of terrorism is the same whether it unfolds in Paris, London or Copenhagen, or in Baga or Garissa. This perception contributes to greater mobilization of support and more declarations of sympathy for victims located “far away” either geographically or culturally. In addition, the obvious lack of balance in reactions to the suffering of “the others” has become a powerful narrative in itself, something that mobilizes reactions in social media. Criticism about the lack of coverage of the events in Nigeria in January contributed to increasing the amount of attention directed to Nigeria, as illustrated by the growth of the #JesuisNigeria and #JesuisBaga hashtags. Of course it is impossible to say how much attention the Boko Haram attack would have attracted if the attacks in Paris had not occurred more-or-less simultaneously, but there is no doubt that the events in Paris affected how the mainstream media presented the story of the crisis in Nigeria. The last time that Nigeria and Boko Haram received worldwide attention was through the stories of the kidnapping of hundreds of schoolgirls and of the barbaric terrorist organization that attacks schools because they represent “Western indoctrination”. The story from January centred on the fundamental unfairness of the world’s reaction to the victims of terror in Paris compared to the victims of terror in Baga. Hashtag activism: does it make a difference? When a crisis “far away” nonetheless occasionally makes its presence felt, all too often the attention dies down after a brief period, or contributes to spreading simplified ideas about what is at stake. In 2014, the #bringbackourgirls campaign mobilized massive support on social media for the victims of Boko Haram. This new form of “hashtag activism” has enormous power because it spreads so quickly, is easy for anyone to adopt, and accordingly is highly visible for journalists and politicians. At the same time, it is equally easy for anyone (including politicians) to lose interest after entering the hashtag, feeling they have “done their bit”. In 2012 we saw a similar movement with the #Kony2012 campaign. Both the #bringbackourgirls and #Kony2012 hashtags spread with record speed on Twitter and Facebook, but today Joseph Kony is still at large and the Nigerian schoolgirls are still in captivity. Mobilization on social media has enormous potential, precisely because of the opportunities it offers for the rapid proliferation of messages and creating new trends. But this is also where the main challenge lies: every new social-media campaign risks becoming just another one-day wonder. This phenomenon also makes it easier for politicians, who are often the targets of such campaigns, to let the whole thing pass by without comment. The mainstream media have a social responsibility to cover items that are newsworthy, but they will also write about what they think their readers want to read. When so many people are protesting that Boko Haram does not receive enough coverage in the mainstream media, readers also need to click more frequently on news items that address conflicts and related human suffering. This is the main concept behind the Forgotten Crises campaign run by the Norwegian arm of Doctors Without Borders, which produces annual lists of the crises they think are most neglected by Norwegian journalists and politicians. Their Youtube video, Those who need it most, underlines readers’ responsibility to demand increased media attention for these forgotten crisis. The aim must be to ensure continuing attention is paid to ongoing events in Nigeria, on Kenya’s border with Somalia, and in many other places. In the wake of the support for Je suis Charlie, it is also important to remember that freedom of expression varies enormously worldwide, not only because of authoritarian regimes and blasphemy laws, but also because of levels of poverty and need that mean people have no capacity either to worry about or protest their lack of freedom of expression. We should focus also on those areas where such freedom hardly exists.